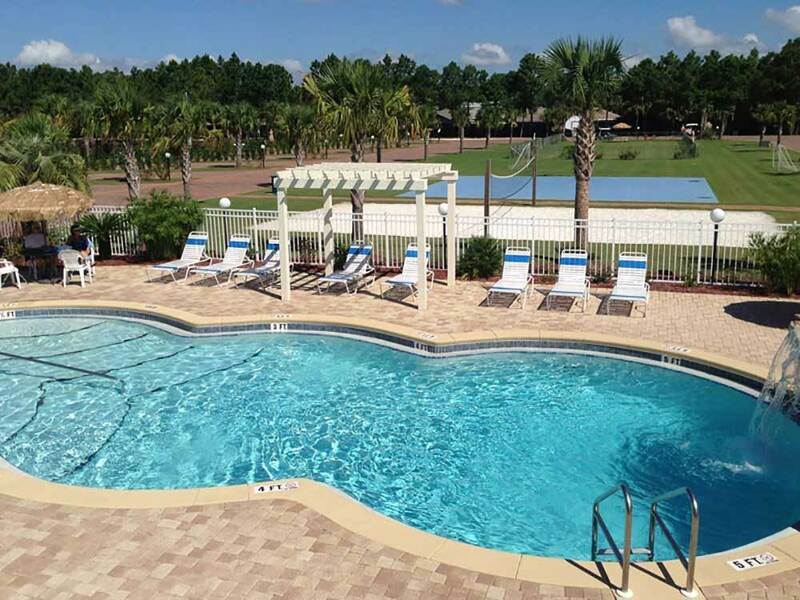 Treat yourself to the best RV Resort destination in North Florida. Experience the most luxurious, cleanest & friendliest resort with spotless grounds & facilities & friendly helpful staff who treat you like family. Great RV park that had everything that a camper needs. Had excellent fenced dog run area that was a welcome feature. One of best we've stayed at. Emerald Coast RV Beach Resort is a premier RV destination located in Panama City Beach, FL. It is a beautiful gated park with both RV sites and park model homes. It is a luxurious resort. There are two large ponds surrounded by pull in sites and the park models. They have many amenities including both salt and fresh water pools. Premium sites are very spacious and include tropical landscaping with palm trees; brick paver roads, pads and patios; gas grill, outdoor seating and table with umbrella on sites. The resort has a 10/10/10 Trailer Life and Good Sam rating and they deserve it. The staff is extremely friendly and accommodating. WiFi was easy to connect to but slow. The best feature is that they are only a mile from one of the most beautiful beaches in the United States! Panama City Beach is a beautiful city located on the Gulf of Mexico coast. It is a very popular vacation destination with hotels, resorts, attractions and shopping along the beach. The spotlessly clean beaches are dazzling with sugar-white sand and emerald green crystal clear water. The city is a very popular spring break destination so beware of the college crowds during months of March and April. We stayed in a Class A motorhome. The only thing bad about this park is the lack of WIFI reliability. Stayed for 4 night in site 180. One of the largest sites we've had. Full brick pavers, weber grill (which worked and was spotless), and patio furniture. Park is well laid out with 2 large pool areas. Dog run park is great. Staff was also very friendly. Only minor complaints are that Wi-Fi can only be connected through 2 devices your stay. There is no switching back, so choose wisely. Also, the larger sites around the lake, have the hook ups off to the side and only halway down the pad, not at the back. Either park close to the front or make sure you bring plenty of sewer and water hose, and also electrical connector wire. Park was quite full when we were there, but it's large enough to accommodate everyone without feeling cramped. Fabulous park. Very clean. Many services. Great staff. Great sites. Backs onto a zoo giving you interesting sounds. My son and I stayed a week in July for a baseball tournament, and we definitely selected the best RV Park in the area! The Park is gated and secure, with all the amenities we could have asked for. The shower facilities (suites) were outstanding, as were the pools and shuffle board courts. We thoroughly enjoyed our stay at Emerald Coast RV Resort, and most certainly will stay there again when we have the opportunity. 1st night in our brand new coach. Been away from RV'ing for 2 years and it was great to be back and what a wonderful location! Emerald Coast RV is a fantastic place to stay! The staff is very friendly and helpful and each and every spot is immaculate. We stayed over a weekend for my birthday and went to Pineapple Willy's in the evening. It's only 1.6 miles from the campground. Breakfast was a buffet style with plenty of good food for only $7...The pool and pool areas were very clean. We will definitely stay there again! Great place to stay. We were on our way back home and did not want to stay at the state park again, so my wife found this place. much nicer than the places on the beach and still close enough to drive quickly to the beaches. Well laid out and very well kept. Very Clean and almost no bugs or ants. You can tell the staff takes much pride in this place. I was doing some laundry and ran out of quarters. I asked security where I could get some close. He said to get on his golf cart and took me to his RV and traded cash for quarters for no charge, just friendly service, then took my right back to the laundry facilities. The pool that we used was a salt water pool and was very nice with a waterfall and half was shallow water great for the small kids. I would highly recommend this place. We stayed for 3 nights and could have stayed longer if we had more time.